The Spooky Vegan: Giveaway: Win a Box of Candy Corn Oreos! A lot of people have lamented the fact that they haven't found the exclusive, limited-edition Candy Corn Oreos at Target this year due to the store not actively re-stocking them despite the popularity (or infamy, depending on who you talk to) of the delicious treats. Luckily, you have a fiend in me and I was able to snag one of the last few boxes at a local Target store to give away to one lucky reader! I'm also throwing in a few extra goodies (nothing big, just some fun grab bag items) for the winner! 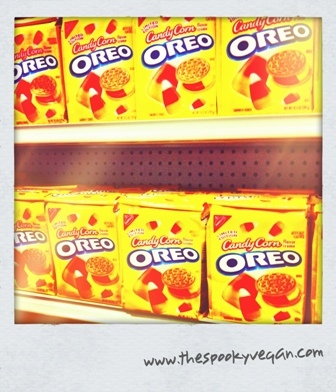 And yes, the Oreos are vegan! Follow me here on Blogger - just find the "Join this Site" button to the right. Then leave me a comment below with your email address. If you are already following me, a comment will enter you into the contest (just make sure to leave an email address too)! Follow me on Twitter and then tweet me "Trick or Treat!" If you already follow me on Twitter you can just tweet "Trick or Treat" to me. "Like" The Spooky Vegan on Facebook and leave a "Trick or Treat" comment. If you already "like" the page then a comment will suffice. Blog about the contest and leave a comment below with a link to your post about it! Share the Candy Corn Oreo love, yo! Note: I will verify all follows and likes! You won't be entered into the contest unless you are following me on Blogger or Twitter or have "liked" the page on Facebook. You can do one of the items above or up to all four of the items above...the more you complete the better your chances of winning! However, please enter only once on each social media platform (i.e. don't tweet at me a bazillion times or you will be disqualified and more than likely blocked) - though you can enter on all of them once to increase your chances of winning! For example, if you do item #1 on the list above that will enter you once in the contest, but if you items 1 through 4 you will be entered four times in the giveaway! In other words, you get an entry into the contest each time you complete one of the items on the list above (for a maximum of four entries). If you need clarification, just let me know...I always feel like I do a horrible job at explaining contest rules! You have until this Sunday, October 21st at NOON Pacific Time to enter! The winner will be chosen in a random drawing and announced Sunday night. I will contact the winner for their shipping address to send the prizes. Sorry international readers, but the contest is open to U.S. residents only (international shipping of food items is too tricky for me!). Thanks for understanding! Thx for entering on FB, Twitter and on here, Krystal! That's the spirit! !